I used to desperately miss wearing dresses when I was breastfeeding a baby, but I’ve since learned that with the help of a Halftee tank or a Halftee Short Sleeve and wrap style dresses, you can easily wear dresses and happily breastfeed a baby! You can watch the video below for more information on how a Halftee tank works, but they are the easiest thing I’ve found to use while breastfeeding (or any other time), and you avoid the heat since they just come below your bust! With our 7th baby due in August I’ve been looking around for dresses that will work, and I’m finding quite a few on Amazon that are on my wish list. 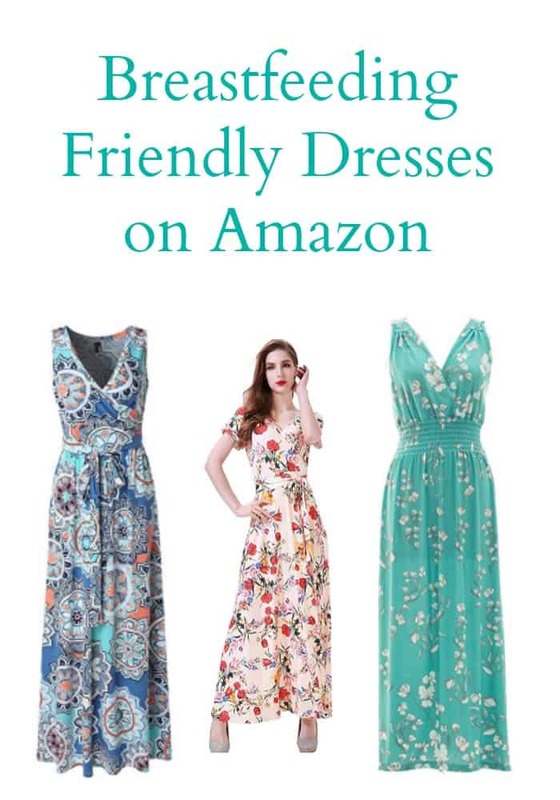 Here are some breastfeeding friendly dresses on Amazon that have great reviews and the prices are fantastic! Available in sizes small – xxlarge and in 13 different prints and solid colors, this looks like a really fun summer dress to wear! I would put a short sleeve Halftee under it. The reviews all say you can nurse in it. I love this print!! I’ve been seeing ladies talk about this dress quite a bit online, and it’s the first item I want to get after the baby comes. It’s available in quite a few prints and goes up to size 3X! It even has pockets. This dress does not have reviews on it yet, but it looks like you could easily pull it down to nurse in. It also looks like it could be flattering for a postpartum mommy tummy. The purple and gray colors are beautiful! Here is a great dress with sleeves, and the reviews say it’s easy to nurse in! I love this dress!! If you are looking for a more fun print instead of the traditional floral that is popular right now, this is a good dress to try. Wear a short sleeve Halftee under it to make it an easy nursing dress. There are several other prints available. This is another cute dress with lots of different prints! The smocked waist looks really comfortable and especially comfy for a postpartum mom! I’m looking forward to ordering some of these dresses and trying them out soon! « The Good and The Beautiful Now Offers Classic Books! The zattcas bohemian print dress looks beautiful in the pictures, but I had to return mine because the circle pattern fell in an inappropriate place on the bust on both sides. It might not be that way with each dress, but on the one they sent me it did. Well, it’s been 35 years since I’ve nursed, but I do remember how hard it was at certain times if not dressed in an easy manner. These dresses are beautiful, I am looking into them even if I don’t nurse. This is great! A good friend of mine modest coverage and easy access for breastfeeding but also fashionable. Can’t wait to share this with her!